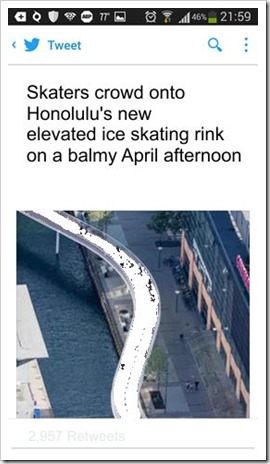 APRIL 1, 2019 (HONOLULU)—Eager crowds lined up this morning at the turnstiles all along the route of the new Honolulu Elevated Ice Skating Rink awaiting the former rail line’s reincarnated grand opening. Honolulu Mayor Tam, elected some say on the basis of his suggestion to refrigerate the already frozen Honolulu rail line and turn it into a profitable tourist attraction, officially opened the skating rink as man-made snow sprinkled the assembled guests and press corps. Tam also announced the awarding of concessions to local businesses to rent skates, protective knee pads and helmets to tourists and to daily commuters (with a Kamaaina discount). Other vendors will offer snacks and souvenirs. The estimate that commuting to town via ice skates would take less time than waiting for a train will be tested for the first time as skaters lined up for an inaugural race from East Kapolei to Middle Street. The winner will be awarded a lifetime supply of shave ice. When the opening bell sounded, crowds rushed onto the slick surface. Most were first timers who found that ice skating is not as easy as it appears on the TV screen, and casualties were reported within minutes of opening. Mayor Tam indicated that he would prefer to watch rather than step out on the ice himself.